The city of Pompeii on the west coast of Italy was originally founded in the 6th century BC by the Greeks. 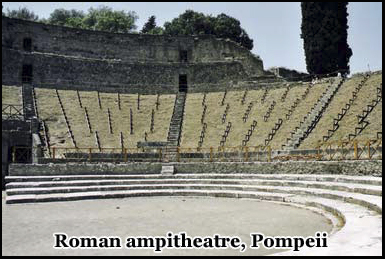 In 80 BC, temples houses and an amphitheater were constructed there by the Romans. The town had been built in the shadow of Vesuvius an active volcano. On August 20th 79 AD a minor eruption caused a series of small earthquakes, and four days later on the afternoon of August the 24th there was a massive explosion that turned the sky black as tons of ash reigned down upon the fleeing population. A thermal energy blast a hundred thousand times greater then that of the nuclear bomb dropped on Hiroshima was unleashed. For almost 1700 years the city and its long dead occupants lay buried until Italian architect Domenico Fontana discovered the ruins during construction of a tunnel. Excavations began over two hundred years ago and still continue. But instead of destroying the city much of the ash had ultimately preserved the former occupants and the buildings they once lived in, and both are forever frozen in time. I was staying in Naples Italy, and to reach Pompeii itself it was about an hours drive south. I would advise people to avoid driving in Italy if at all possible, and take an organized coach trip as Italian drivers are some of the worst in the world. I got to Pompeii at about ten in the morning. It is well sign posted being one of the areas major tourist attractions, and it is located just a few minutes off of the motorway. You will see Mount Vesuvius in the distance on your left hand side, long before you reach Pompeii itself, and once you park the car it is only a few minutes walk to the entrance. There are several restaurants and stalls selling souvenirs along the outside road. But if you want anything to eat or drink, make sure you buy it before you go inside, as there is nothing available once you are in the city itself. Although it’s just gone 10 am there are already dozens of coach loads of tourists being offloaded, and it is close to 90 F.
There is a admission fee, and you have the option of getting an electronic audio guide. One thing to realize is, this is that the area that you will be walking around is several square miles, and there is little shade and no water or restrooms. But although this is inconvenient, it does help to preserve the city as it once was and there are few signs of the 21st century once you enter. First you walk up a slight hill and pass through what is known as Port Marina, this was one of the gates to the city and is the one closest to the sea. Although from where I’m standing I can’t actually see the ocean, but there is an explanation for this. Before the volcanic eruption the sea was only 500 meters away. But the explosion produced so much ash and debris, that it created an artificial shoreline of almost two kilometers. In later years this area was built upon and there is now a village where the sea once was. As you pass through Port Marina you can see that the layout of the streets ahead of you are much like those of a modern day city. There is a main street and many side streets in a grid pattern, that lead up and down the slight hill. If you look over to your left there is a mountain range with one particular mountain much larger then any of the other ones. This is Mount Versuvous . What you will notice is that it does appear to be a considerable distance away from the city. 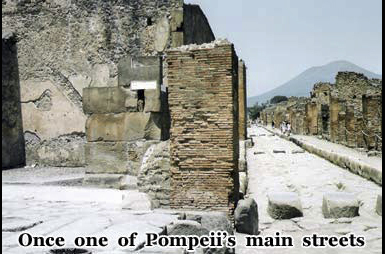 Most people assume that Pompeii was built beneath it on its slopes. But it is actually several miles away. On your right hand side there are some ruins that were actually destroyed by the earthquake in 62 AD as opposed to the volcanic explosion in 79 AD. This was once the temple of Venus, but only a few stones remain. The streets are much narrower then those in a modern city, and either side there are blocks of flat stones that once acted as pavements in front of the houses and shops. Today they sky is completely blue, it’s hot and there’s very little breeze. 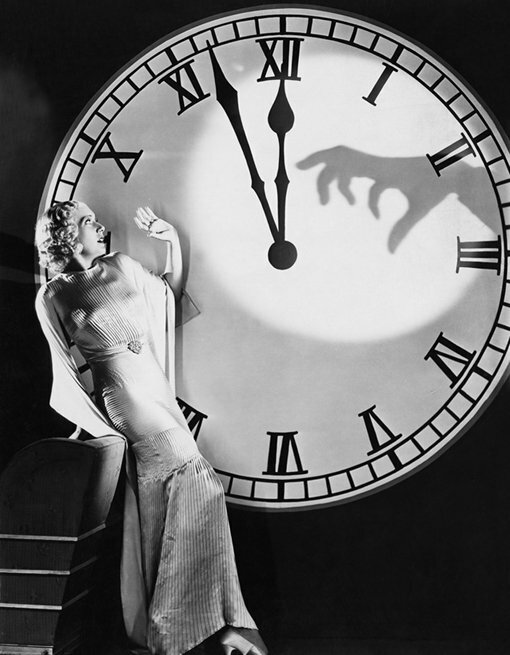 But on the afternoon of 79 AD on August the 24th the sky turned black. The volcano was almost 9 km away and still managed to bury the entire city as the sun was blotted out by volcanic ash. The eruption continued to the next day, it was a gradual process that at its peak was estimated to have thrown out over a hundred thousand tons of deb town and its inhabitants to a depth of almost ten feet gives some idea of its power. After about ten minutes walk I came to a large square with once elaborate ruins running around all sides. This area is where the temple of Apollo and the Forum once stood. Although the roofs no longer remain, many of the marble columns and statues still survive. You can peer across the square to see Mount Vesuvius framed in the background and this gives some of the most dramatic views in the entire city. The Forum was the center of political and religious life for the people of Pompeii ; along its sides are large stone pedestals upon which statues of the city’s most important people was stood. If you continue along the main street you will pass many roman villas. Several of them still have ornate pictures painted on the walls that were almost perfectly preserved under the ash. Many of the mosaics on the floors are also virtually untouched. Although many parts of the buildings still stand, it was the weakness of the roofs that caused the deaths of many of the inhabitants. Those that couldn’t escape tried to shelter in their homes, and gradually as the weight of the ash built up, the structure collapsed on top of them. 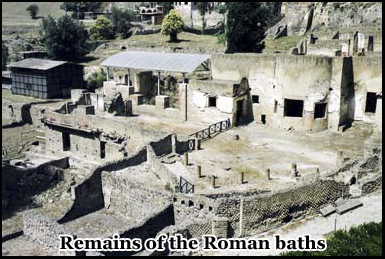 Although a large part of Pompeii has been excavated there is still about a fifth of it that is still buried. You can walk around the city for hours and not see it all. and walk among the exhibits. This was an entire community destroyed in a matter of hours by the same volcano that still looms on the horizon in front of you. Further on, the main street slopes downwards. You first pass a building that was once a barracks for the roman gladiators, then beyond that is a house known as that of the Chaste Lovers. 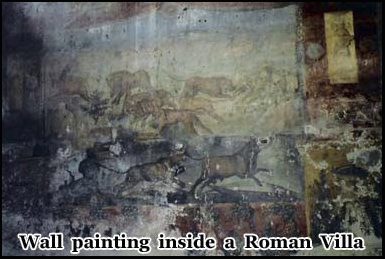 Painted on the walls are several pictures showing very little signs of decay. Although thousands of years old the colors barely seem to have faded, and great care has been taken to preserve and restore them. The population of Pompeii at the time of the eruption was made up of about 40% slaves, and the rest were noblemen, soldiers and merchants. One of the results of the volcanic ash clouds was to bury people where they fell, and preserve them much like fossils. 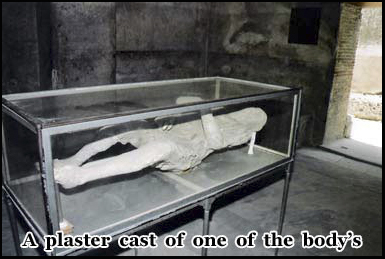 In 1860 a man by the name of Guiseppe Fiorelli came up with the idea of filling the spaces that the body’s once made in the ashes, with plaster of Paris. This captured in minute detail their moment of death. There are many of these body casts throughout the city. Many of them at the exact locations they fell almost two thousand years ago. Although many had fled Pompeii after the start of the first eruption on August the 24th, it was on August the 25th that the volcano became its most deadly. Part of the mountain imploded in on itself that caused massive earth tremors and tidal waves to sweep inland across the bay of Naples. Then a pyroclastic flow composed of gas, ash and volcanic rock drifted across towards the town of Pompeii at great speed, only taking about five to six minutes to cover the 9 km to the town. It was this lethal combination of super heated air reaching temperatures of up to 800 C and a black suffocating ash cloud that killed so many. As you walk along the street down towards the amphitheater, you pass ruins that were once people’s homes, shops where people once brought bread and temples where they once prayed. A few thousand years later you can still walk along the same streets that they did. 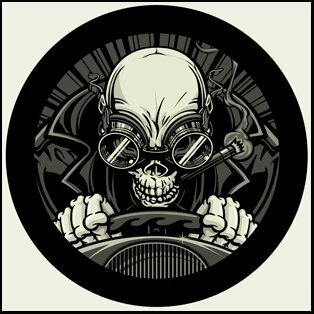 I have been to other “ghost towns” in Arizona, and Nevada. But the fact that this was mostly built of stone rather then wood meant it is far better preserved despite its greater age. Just before the amphitheater is the Palaestra which is a huge grass walled courtyard. There was also once a large swimming pool which just likes a modern day pool, slopes from a shallow to a deep end. If you continue beyond this, there is the entrance to an amphitheater that was built in 80 BC. This is believed to be the oldest known roman amphitheater ever discovered and lies largely intact at the east end of the city. If you walk out into the middle of the arena you notice that the ground level is actually below that of the surrounding area. 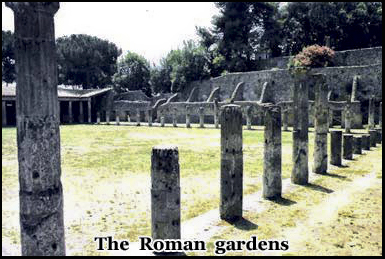 This is because the earth to support the angled stone seats around the arena is supported by the earth dug from its center. Much of the structure was destroyed by the earthquake in AD 62 but was rebuilt, before being completely buried in AD 79. There are two entrances to the amphitheater one at the north end the other at the south. Next to both of these there are two small rooms known as “Sporgliarii” these are believed to be where the bodies of the dead gladiators that fought in the arena were brought after battle. The amphitheater also once had a canopy around its upper region that provided shade for the crowds during hot weather. If you compare this to today’s sports stadiums, you can see how similar in function and design they still are even after two thousand years. If you walk back out of the north entrance of the amphitheater you come to a grassy area, which leads back to the main street of the city. These streets would at one time have been clogged with dead bodies from people trying to escape. In modern times excavations began in the 1700’s during which, aside from the ruined buildings, almost 1800 scrolls written in Greek were discovered in the rubble. In 1763 an inscription was found that confirmed that the city was indeed that of Pompeii. In 1798 when the French invaded Italy under Emperor Napoleon the extent of the city walls were uncovered. In 1835 excavations ceased. Then in 1838 queen Victoria visited the site. In 1865 the city was divided into grids and the houses numbered, and modern scientific excavation principles were applied. In 1943 the allies dropped 150 tons of bombs on Pompeii in the belief that the Germans were using it to store ammunition. 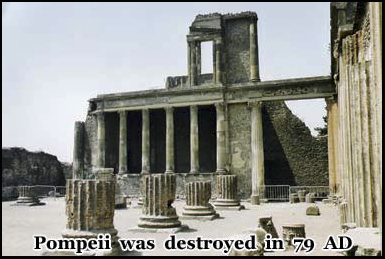 In 1963 the city of Pompeii again became overgrown and fell into disrepair. Then excavations began once again, and in 1980 150 skeletons were found within the arches of the marina. Today work still continues, but there are almost forty of the 160 acres that the city covers that are still hidden. 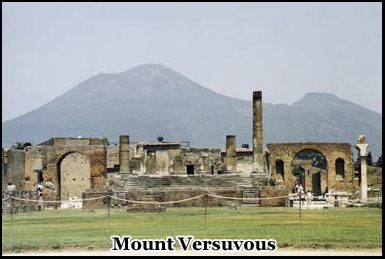 Vesuvius still towers in the distance and after AD 79 it is has erupted frequently. Major eruptions occurred in 472 AD and 1036 AD. In 1631 between 4,000 to 18,000 were killed as the volcano again exploded causing its crater to expand from 1 to 3 miles. This also once again created earthquakes and a tidal wave that swept across the bay of Naples Versuvous erupted again in 1906, and also in 1944. On this occasion it destroyed allied bombers stationed at Poggiomarina, and the Germans used the illumination from the molten lava to guide their bombing raids on Naples . Another major eruption is long overdue, and currently almost a million people now live in its path. Hey Buddy!, I found this information for you: "Pompeii". Here is the website link: https://www.chasingmidnight.com/pompeii. Thank you.